Identifying well-defined behavioural patterns in the work­place may not be easy. At least not with those that have the biggest potential to improve wellbeing and performance. For this rea­son, it’s important to look at the discrete, individual level of habits. By empowering people with a knowledge of how to either build new positive habits, or stop a more damaging one in its tracks, we may help build high-performing teams. We believe habits to be a source of untapped potential for an organization. As human beings we like habits. They represent the known, give us control, and help us save energy and deal with stress. Although we may perceive certain behaviour as good or bad in others, it is not always so clear-cut for ourselves. 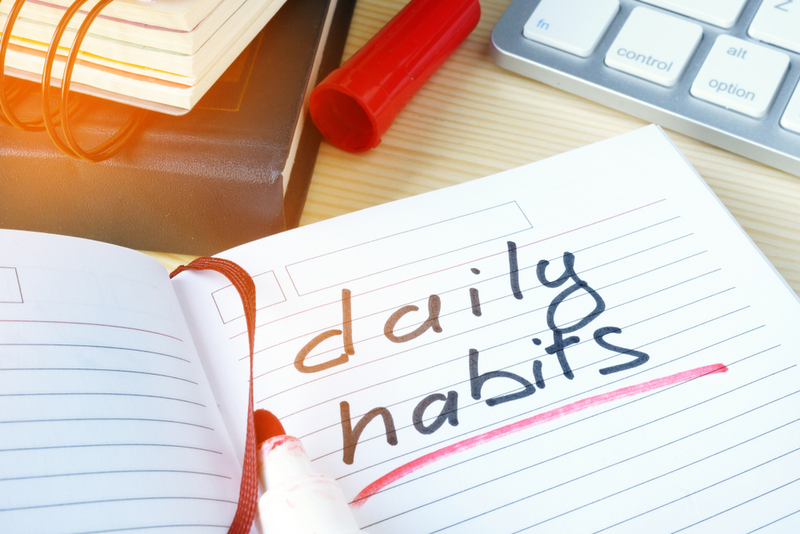 When we create a habit the brain stops participating fully in the decision-making process, and doesn’t distinguish between good and bad habits. So what are the tactics that help us take a step back, to first identify the good and bad behavioural patterns in our own lives and teams, and have a better chance of changing them? We have developed the 7S model, comprised of seven behaviour ‘hacks’. Inspired by Covey, the following elements are the seven hacks of highly effective habits. They are the result of a decade of executive teaching and research. The typical approach to change is that of a significant effort towards achieving an ambitious goal. By definition, this significant effort is deployed now and again, which may or may not lead to success. Yet a much smaller (and therefore more sustainable) effort on a daily basis is likely to yield a greater benefit. Daily implementation is key. Making it small also increases the chances of creating a new habit, since it gains ‘automaticity’ in less time. Researchers at University College London found the amount of time for behaviours of vary­ing complexity to become automatic ranged from 18 to 254 days. For example, creating the habit of drinking a glass of water took much less time than doing 50 sit-ups, with the authors finding a plateau to be reached, on average, after 66 days. Setting SMART (specific, measurable, agreed-upon, realistic, time-based) objectives helps to achieve professional targets and the same detail-oriented approach can help on a personal level. Set a finish line. Rather than making an open commitment to always take the staircase, start with a commitment to always take the staircase for the remainder of the month. Achieving your objective will give you the motivation to keep going. Given the daily approach, another key detail is when in the day you will commit to the change – try and fix the same time each day. Support your new action by placing it next to an existing one. Triggers give us a broader view of the behaviour and make it easier to implement, or displace, through considering the habit loop. A cue or signal exists before the habit, which then produces a reward. Rather than focusing on the behaviour itself, can you change the cue or reward? Considering the habit loop in its entirety also shifts the focus from the ‘hard’ routine to the much easier cue. Once we enter into the process we’re committed to follow-through. Share your change with your family, with your friends, or with your boss. Sharing your change makes you accounta­ble. And we all need to be held accountable. In the workplace, adding ‘bottom-up’ to the usual ‘top-down’ accountability has much potential. Leaders are often gauged on their credibility by matching their actions to their words. By sharing your own critical behaviours with your team you are creating a healthy pressure to follow through. Tracking the completion, or absence, of a certain behaviour over time creates a chain. This logic is used in many apps today. For example, one may achieve special badges for maintaining a streak of daily practice such as meditation. If you have a bad day after 150 days of completing the same practice and the last thing on your mind is meditation, the simple fact of having completed 150 days will probably get you over the line to complete 151. An extreme example comes from the former British Olympic marathon run­ner Ron Hill. In January of 2017, at age 78, he brought to an end 19,032 consecutive days of running at least one mile. Again, we may imagine that on many occasions during those 52-plus years he may not have wanted to run, with the power of the streak the only thing of relevance. While running sick and with chest pains on the final day of the streak he felt it unfair on his family to con­tinue, so decided to bring the streak to an end. In an increasingly digital world, the physical environment matters more than ever. It is a powerful determinant of our behaviour. Consider, for example, your home environment and a com­mitment to completing morning yoga. One of the keys to building this into the daily routine would be to have the yoga mat in plain view. That way, rather than blearily fetching coffee as part of your daily stumble out of bed, unfurling that mat is a more natural part of the daily flow. It’s a similar, even simpler principle to that of laying out your workout clothes the night before an early-morning training session. At work, simple changes could include a standing desk, new vend­ing machine content, or changes to the staircase in order to make it more inviting. We can all think about redesigning our surroundings to support behaviour change and nudge ourselves and our teams to implement the critical few behaviours that support an improved culture. What we often perceive to be our own behaviours are due to the influence of our family, friends and colleagues. Thinking of our social environment will allow us greater insight to the habit-hacking process. Think of who you spend time with, both personally and professionally. Who are the people that will help you most in the formative stages of a new behaviour? We may also think of our leadership activity and the design of teams. Research has shown the positive impact of placing a poor performer next to a high performer, with positive ‘spillovers’ created in terms of productivity, effectiveness and client satisfac­tion with the work. The research suggests pairing employees with opposite strengths, as well as separating toxic workers. Are all 7Ss to be employed in every case? Probably not. That is part of the habit-hacking process: finding out which ones are most important for you to gain traction in behaviour change, either to create and sustain a new healthy habit, or stop a more negative one in its tracks. Steven P. MacGregor and Rory Simpson are the authors of Chief Wellbeing Officer. Steven is the founder of The Leadership Academy of Barcelona with recent clients including McKinsey, Salesforce and Santander. Rory is the Chief Learning Officer at Telefónica, and formerly Associate Dean of London Business School. He has delivered leadership seminars in over 25 countries from China to Iran and Chile.